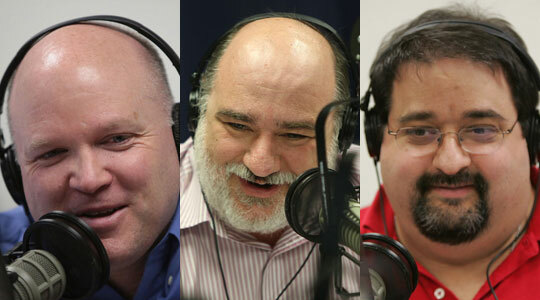 Summary of today’s show: Easter week continues as Scot Landry is joined by Antonio Enrique and Domenico Bettinelli to discuss the headlines of the week, including Pope Benedict’s Easter Sunday Urbi et Orbi message; the US bishops’ latest and forceful statement on religious liberty; Divine Mercy Sunday; 40 Days for Life; the rescinding of an invitation to Vicki Kennedy to a Catholic college commencement. 1st segment: Scot Landry welcomed Antonio Enrique and Dom Bettinelli to the show. Scot asked how their Easters are going, noting that we celebrate Easter over eight days. Dom said his kids are continuing to sing the Easter hymns and prayers they hard at the Easter vigil. Antonio said his own parish has an Easter Vigil that lasts all night and his whole family attends. Scot said on Easter Sunday the Holy Father gives an address called Urbi et Obri, meaning “To the City and the World.” Scot read most of the pope’s message. Scot said he notes how present the word ‘hope’ is in the messages of Pope Benedict. Dom said this is a time when so many are lacking in hope. He recalled Eric Genuis said on Monday’s show that he sees a lack of hope in the 100,000 youth per year he plays for and Pope Benedict is holding up Christ as the single point of hope. In a time of a lack of faith, we see a lack of hope. Pope Benedict is telling us that Christ is present to us today, He is alive today. Scot said the most important fact in the Christianity is that Christ is alive and rose from the dead. Antonio said as important is that he left us the Holy Spirit. The Resurrection is a fact that carries on in history and helps people to have change in their lives. Antonio recalled a Russian story during the Communist re-education of Orthodox Christians to convince them of atheism. The Risen Christ brought hope to them and it brings hope to us today. Antonio said Pope John Paul II said in Evangelium Vitae that no matter how hard things become, we know how the story ends: Christ is victorious. Scot said at Easter what stands out to him is the joy of Alleluia as part of the season and how quickly we can leave the spirit of Alleluia when we return to our normal daily lives. Easter is an octave to allow it to take root in our daily lives. Dom said the joy of Easter could be hard to sustain so what do we do to keep Easter alive in us. Easter is also a season of 50 days until Pentecost. We can pray the prayers of Easter, remembering to say Alleluia, to wish a happy Easter to others. Returning to hope, this hope is not a passive hope. “In this world, hope cannot avoid confronting evil.” Hope brings Christ to the world. It doesn’t simply wait for something good to us. That’s a way of keeping joy alive. Scot said the Octave concludes with Divine Mercy Sunday. always the second Sunday of Easter since 2000. Jesus died for reconciliation for all of us. There are several articles in the Pilot and Anchor on Divine Mercy, particularly on the may people who need to be reconciled to God and we need to reach out to them. Antonio said if your life is transformed in Christ, then you can have joy despite problems and bring that joy to others. Divine Mercy Sunday fits perfectly within Easter. Once we’ve experienced the joy of the Resurrection, then we can go out and share the joy of Easter with others and ask them to come back. Scot said a week ago last Monday, we had Fr. Kaz and Mary Kay Volpone from the Divine Mercy Shrine in Stockbridge on the program, giving a background on the message and Divine Mercy Sunday. It’s a message and devotion that most Catholics are still hearing about. It isn’t totally ingrained in the Church. It often happens with new devotions in the Church. Pope John Paul II put this devotion forward, he took his last breath on the vigil of Divine Mercy, and was beatified last year on Divine Mercy Sunday. Dom noted the beauty of the diversity of devotions within the Church. There seems to be something for everyone and every temperament to find a way to God through the Church. The devotion shouldn’t be just for the devotees, the same people in the parish showing up for the service and then going home. We’re not saying that the prayer services are bad, but if they’re not coupled with action, there won’t be fruit from it. Not that there isn’t a place for contemplative prayer life, but if you can we must couple prayer with bringing the message to people. God loves you, God forgives your sins, mercy is available. God isn’t just a judge sitting on a throne waiting to throw the book at you. He wants to jump off the throne and run to embrace you like the prodigal son. Scot said a central message of Divine Mercy is that the Church is meant to be a refuge for sinners, not a museum for saints. What is being said is that members of the Divine Mercy apostolate must focus outward ,not inward. We must look for the one sheep that isn’t part of the 99 or the 75 not joined to the 25. He suggested people learn more. 2nd segment: On page two of the Pilot this week, we see that Fr. Gerry Dorgan of St. Mary of the Annunciation Parish in Danvers has been granted Senior Priest/retirement status by Cardinal Sean effective June 5, 2012. Fr. Dorgan was on our program a few months ago. Fr. Dorgan was Fr. Mark O’Connell’s first pastor out of the seminary. Dom said he remembers from the show Fr. Dorgan’s devotion to art history and how he incorporated it in pastoral ministry. It’s impressive how he used his talents and interests in parish service. Scot said Fr. Dorgan’s been a priest for about 50 years and noted that many legendary priests will be retiring in the coming year. Scot then noted another article in the Anchor about the 40 Days for Life campaign in the Diocese of Fall River. He noted that the Archdiocese hasn’t embraced it officially because of the difficulty of the John Salvi murders an the complications it presents. Antonio said this campaign has been effective in changing hearts and minds since it started in 2004. That these warriors for life can bring attention to this issue is welcome. Antonio noted that the 40 Days for Life did take place in Lynn and Haverhill, even though officially sponsored by the Archdiocese. Scot said this apostolate started at a college campus ministry at College Station, Texas, at Texas A&M. Some young people wanted to take concert action. Dom said it’s inspiring to see how many young people take part in the pro-life movement. He recalled at Franciscan University of Steubenville about 20 years ago that some of his classmates organized a walk across America , stopping along the way to witness to life and it’s ongoing. It’s an opportunity for young people to put their faith into action. Dom explained that 40 Days for Life is that during Lent there is someone standing outside a clinic every day from morning to evening, praying for everyone there, talking to to those who would work. And there is great fruit from it: conversions of clinic workers, clinics that close, and women who decide to keep their babies. Scot said McManus was concerned that it would give the impression that someone could hold positions contrary to the Church’s teachings and still be honored by a Catholic institution. Scot said McManus thought he was doing his job as bishop and wasn’t trying to be harsh toward Vickie Kennedy. Dom said this is right in line with the US bishops’ 2004 statement Faithful Citizenship, where they said people who hold views contrary to Catholic doctrine on impotent moral issues should not be given platforms or honors at Catholic institutions. The bishop doesn’t want to give the impression that it’s okay to oppose the Church’s moral teachings as a Catholic. We don’t want to tell these graduates that we don’t take our own teachings seriously. Bishop McManus wasn’t being strident. He only said he couldn’t attend the graduation and it was the school’s decision to rescind. Scot said as a Catholic college they said they value the bishops’ role. Scot compared it to what happened at Notre Dame where then-Bishop D’Arcy said he couldn’t attend a graduation where President Obama was going to receive an honorary doctorate. Notre Dame decided to go ahead anyway. Antonio said we’re going to find this more and more in the Church as society moves away from critical values. The Church has a prophetic role and the bishop has to be able to star we can’t condone an event like that. He describe a way of thought called proportionalism, in which people say they will believe differently in their personal lives. He said the Church needs to clarify that the Church teaches one thing and some issues are not negotiable. Scot said this issues can be controversial because not every bishop applies the standard in the same way in his own diocese, and interprets what positions go beyond the limits to say the person doesn’t deserve the honors or platform. Another local story is that the seniors at Fontbonne Academy had their annual social justice fair. The students take on projects related to the topic of social justice. Antonio said he was struck by the part of the story about Chinese exchange students talking about being survivors of China’s one-child policy, being given up by their mothers to relatives so they could live. Antonio was struck by the sadness in the girl who said her mother had to act like she hadn’t been born. He also said sometimes there is distinction made between social justice and pro-life issues as if they were different. He’s glad that wasn’t the case here. She wins Diary: Divine Mercy in My Soul by St. Faustina Kowalska. 4th segment: The US Conference of Catholic Bishops today issued a major new statement on the topic of religious liberty. From well before Cardinal Gibbons, Catholics in America have been advocates for religious liberty, and the landmark teaching of the Second Vatican Council on religious liberty was influenced by the American experience. It is among the proudest boasts of the Church on these shores. We have been staunch defenders of religious liberty in the past. We have a solemn duty to discharge that duty today. Scot said this statement has been anticipated after the US bishops formed this committee last year for this purpose. This document creates the framework by which we will defend our rights. Dom said our liberties have been attack for many years. It should also concern those beyond our borders. The US has been a leader in the fight for freedom in the world, as a beacon of freedom and hope. If that freedom erodes here in this country, how will that light be extinguished elsewhere. And when we lose this freedom, what freedom will we lose next? What other rights will they decide we don’t need? Scot said the document’s objective seems to inform the broader community about what we stand for, what is the history of religious liberty in this country, and then the real call to action through prayer in the fortnight for freedom. Antonio said it’s not just the bishops who must act, but all of us. Jesus said we are the salt of the earth and we are obligated to influence others and to speak up. We have an obligation to follow the government, but not when it contradicts the will of God. He also noted that contrary to the French revolution which said rights came from the state, in the United States our Declaration of Independence declares our rights as inalienable and descending from God. We are going through a fundamental change in this country. In Europe, the government can decide how people can use or lose their rights. This is a key moment in how we understand our rights within our society. Scot said the bishops are clear that religious heritage in our country appreciates religious freedom for all, whatever their faith and that we should be able to live our belief systems in the public square and not have those beliefs be seen as contradictory to our American citizenship. the bishops are saying it’s un-american to say we can’t live our faith in the public square. Dom said he hopes that other faiths join in this fortnight for freedom because this applies to all of them. Scot said the bishops make that very point. This year, we propose a special “fortnight for freedom,” in which bishops in their own dioceses might arrange special events to highlight the importance of defending our first freedom. Our Catholic institutions also could be encouraged to do the same, especially in cooperation with other Christians, Jews, people of other faiths, and indeed, all who wish to defend our most cherished freedom.